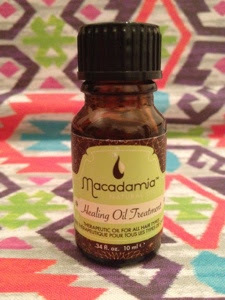 Macadamia healing oil treatment is a leave in oil treatment for hair. I received this as part of the goodie bag from December's #BbloggersXmas event in London and was really excited to try it having heard a lot of good things about the brand. The oil smells wonderful - slightly nutty, but not too strong. You apply a small amount to you hands, and work through damp hair. You can also use it as a finishing treatment to dry hair to control frizz. I was a little worried that this might be too heavy for my fine hair, but I needn't have worried. The oil leaves my hair looking healthy and shiny, but without weighing it down. You can just about see the oil here! I've also used the oil as an overnight treatment by applying about a 10p's worth of oil to dry hair and letting it sink in overnight. when I was my hair in the morning, it's super soft and really manageable. For an alternative hair treatment, there is also an intensive hair mask which I reviewed here. The oil comes in several sizes, ranging from 10ml (approx £3.75) to 125ml (approx £29). This is my new favourite hair product and I will definitely be re-buying once it runs out. Have you tried anything from the Macadamia hair range? Hi I found your blog through the #bbloggers blog hop and I'm your newest follower. i love hair oil and have wanted to try this one for so long but never actually got round to buying it yet!After reading this I think I might need to though. I've tried argan oil for hair, but never macadamia oil - you've made me want to rush out and try some! it's gorgeous! My favourite hair product this month by far.